Throughout the holiday season (and year round!) we encourage Canadians to purchase a goat or other livestock to support a family in Africa, through the Best.Gift.Ever gift catalogue. We receive questions from good-hearted Canadians who want to make sure that a gift of livestock is an effective way to support a family, and that the animals are well-cared for. This year, we’ve gathered Canadian Feed The Children’s best goat intelligence – hearing directly from families you’ve helped – to answer five questions we were asked about what really happens when you give the gift of a goat, sheep, pig or chickens to a family in Africa. What happens after I donate $75 through the Best.Gift.Ever gift catalogue to give a goat to a family in Africa? When your purchase a Best.Gift.Ever gift, your donation is pooled with those of other donors to fund the community project(s) it supports. For example, when you donate $75 for a goat, you are not only providing funds to purchase a goat for a family, but also to provide training and support for community members in a variety of different communities who will be receiving them. All goats are purchased locally and no Best.Gift.Ever gifts are ever shipped from North America to our international locations. Buying locally helps support the local market, keeps transportation costs to a minimum, and benefits the country’s overall economy. 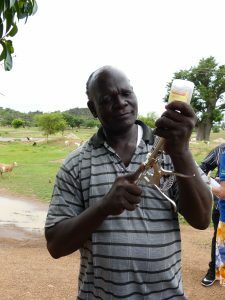 Staff members from local partner organizations (who help to implement Canadian Feed The Children’s programs) work with communities to identify vulnerable, often female-headed families who would most benefit from receiving small livestock like goats. How can a poor family in Africa take care of a goat? 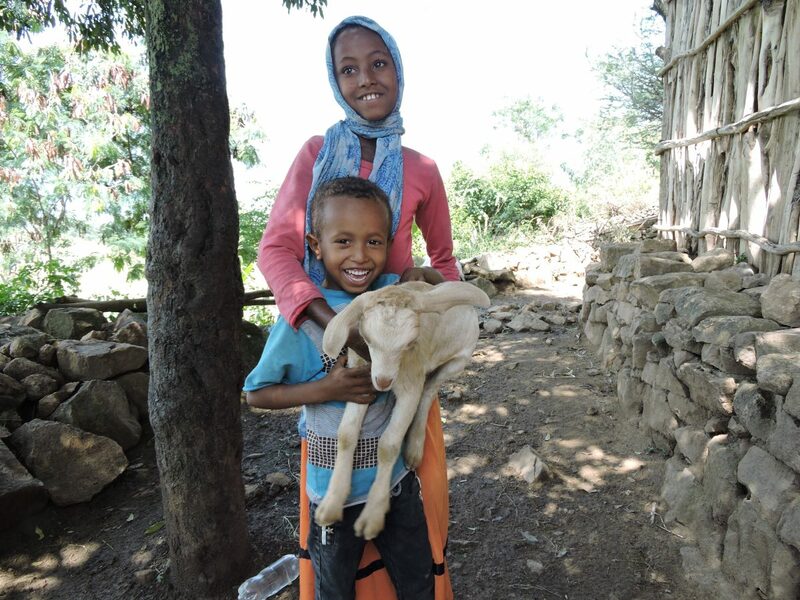 When a family receives a goat they also receive a commitment from Canadian Feed The Children to support them in rearing the animals in a safe, healthy, and humane way. That means that they receive training about proper care for the animals including learning about their nutritional and housing needs and how to provide for them. 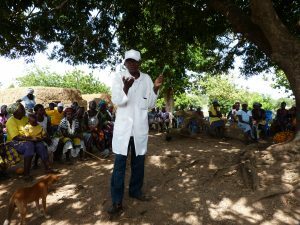 They are connected with local veterinarians, and in many c ommunities we fund the training of local animal health practitioners to provide broader support to those rearing small livestock. For many families we support in Africa, goats are the most important asset they own. Keeping a goat in good health means that they will be able to put their children through school, pay for medical care for their loved ones, and put food on the table. It is in each family’s best interest to treat goats with the best care they can – and we help make sure they have the resources to do so. How does a goat help feed a family? Goats can be used as a source of nutrition – like providing milk to growing families – or as an asset that can help families pay for food at market for their children. Many families receive more than one goat from Canadian Feed The Children so that they are able to breed them, or are part of breeding schemes where a single male goat “makes the rounds” to various families. Once a family has a small herd of goats, they are able to sell a couple at market to earn an income to support themselves. Most community members we work with use the income they earn from selling goats to invest in a larger, more sustainable enterprise. Many use the capital to start small businesses like opening a cafe or shop from their home. 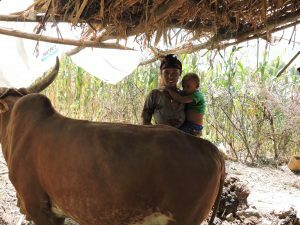 Others purchase larger livestock animals such as an ox to help plough their fields, increase their productivity, and earn more from their yield. 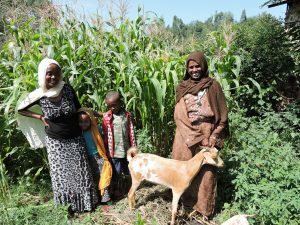 For women who are unable to receive traditional loans from a bank – because women are often barred from owning property or assets – goats give them an opportunity to escape the cycle of poverty, become entrepreneurs in their communities, and take care of their children. Do goats negatively impact the local environment? There is evidence that intensive farming – that is, large-scale, concentrated operations where thousands of animals are corralled and raised for human consumption has a large negative impact on the environment. 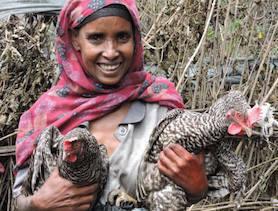 However, small-scale farming of the type practiced by the participants in CFTC’s livestock programs does not have nearly the same impact on the environment. Canadian Feed The Children has helped communities learn how to reduce the impact of farming even further. Goats are a preferred livestock animal for environmental reasons because they are “browsers” not “grazers”, which means they do not opt for eating grass. Instead, they prefer leaves, weeds, and organic material that humans would otherwise not eat. This means they are easy to feed, and are a lot less likely to contribute to loss of vegetation, erosion, or significantly impact the local environment. Canadian Feed The Children is committed to integrating climate-smart practices into our programs. This includes leading environmental conservation efforts, providing climate-friendly stoves, teaching climate-smart agriculture, and training Natural Resource Management group members to lead their communities towards environmentally-friendly practices. How is giving a goat a sustainable solution to poverty? 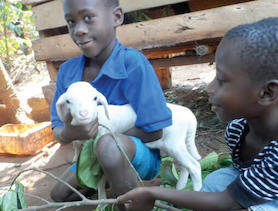 When you give the gift of a goat you are not just helping one person, or even one family! Many of our programs include a “pay-it-forward” mechanism, whereby a family is required to pass on the goats they receive to another family in need once they have successfully bred them. That means that giving a goat to one family can actually help an entire community transform itself over time from poverty to prosperity. 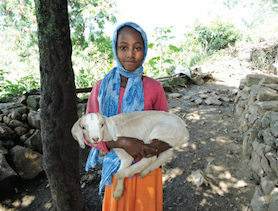 Most recipients of goats and other small livestock through Canadian Feed The Children are women. We know – and the Sustainable Development Goals have confirmed – that the only way to truly end extreme poverty is by empowering women to change their lives and communities. When you give the gift of a goat to a woman, you are doing just that.